Improve the look and feel of your home with tile flooring in Champaign, IL. Our flooring showroom offers a wide selection of tile options in floor coverings. We carry tile flooring of all shapes, sizes, and colors. Best of all, we carry products that cater to your taste and meet your demands for performance. Simply choose the type of tile -- ceramic, porcelain, or slate --, and we’ll do the rest. As a flooring contractor, we have a great deal of experience in the industry, and we know how to transform the look of any area. In addition, we handle projects of all sizes and scopes. In addition, our store features excellent guarantees on our products and services, including tile floor installation. One of the most dramatic ways to improve the ambiance of your home is to install contemporary ceramic tile. It’s a versatile and durable floor covering that lasts a lifetime. In addition, this tile resists moisture, stains, extreme temperatures, and damage. Choose from an endless selection at our store. 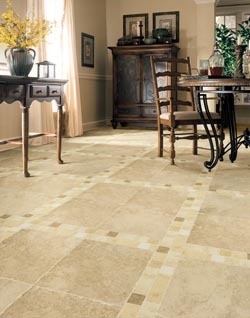 Easy to maintain and perfect for any room in the house, ceramic tile flooring is the perfect choice for any homeowner. The ideal choice for many flooring applications, porcelain floor tiles are strong and beautiful with a modern appeal that suits any décor. It can be used for many decorative purposes and in any room from the kitchen to the bathroom to the living room. Like ceramic, porcelain is resistant to extreme temperatures. This makes it an ideal material to use in outdoor areas like the patio or even around the swimming pool. No matter what type of interior style you’re going for, we have a selection to suit your needs. While many types of tiles are made with ceramic or porcelain, we also carry options in natural stone, such as slate or travertine. Stone tile flooring gives your home upscale ambiance that makes it a nice place to live. In our showroom, we have many samples of natural stone tile to share with you. We are much more than a flooring store. After we help you select the floor of your choice, we offer tile floor installation by our on-staff professional installers. We stand behind the quality of our services as well as our products. When you choose us for flooring products and installation services, we ensure that you have a confident, worry-free, and enjoyable experience. By allowing our installation professionals to properly remove your old flooring and install your new tile floor, you know that each step is handled with care by experienced flooring technicians who utilize the best equipment and methods available. Protect your investment by leaving the installation to us. Contact us today! We proudly serve residential and commercial customers from Champaign, Urbana, Mahomet, Lake of the Woods, Augerville, Illinois, as well as the surrounding areas.